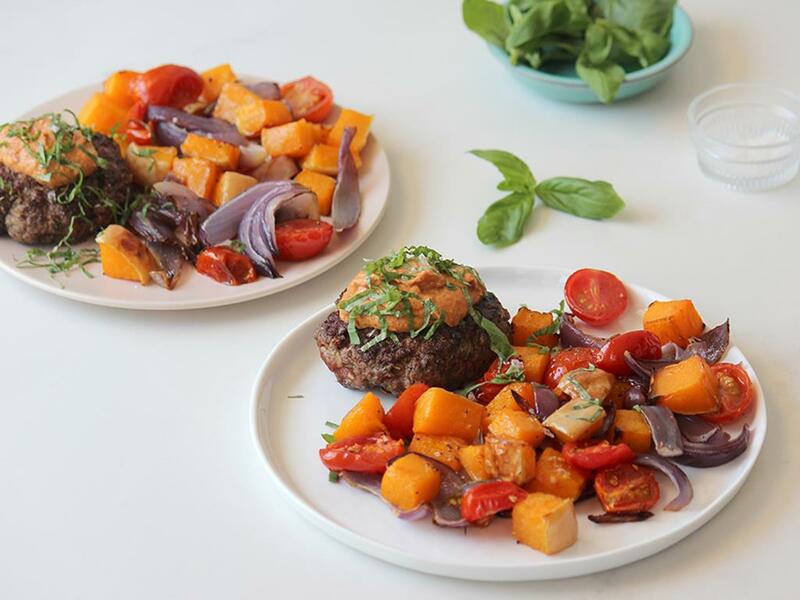 A beef patty with mixed herbs & garlic, topped with creamy harissa & fresh basil, served with roast veg. Roast veggies: Place the butternut and onion wedges on a tin foil lined baking tray with a drizzle of olive oil and season with salt and pepper. Mix, arrange in a single layer and place in the oven. After 15 minutes of cooking, place the tomatoes on the same tray with olive oil and salt and pepper, and roast for another 10-15 minutes until the butternut is soft and all the veggies are slightly golden. Harissa yoghurt: Mix together the yoghurt and harissa paste. Patty: Mix together the beef mince, mixed herbs and garlic, season generously with salt and pepper and shape into a patty. Add a drizzle of olive oil to a pan on medium-high heat. When hot, add the patty (it should sizzle when it hits the pan) and cook for 4-6 minutes each side until cooked to your preference. Serve the patty topped with the harissa yoghurt, and the roast veggies on the side. Slice the basil leaves thinly and sprinkle over the harissa yoghurt.